Helmuth's frontispiece is a copy of Christian de Mechel's. arl Helmuth was a Prussian officer and author of several books about warfare. He inherited a copy of Christian de Mechel's engravings of Holbein's dance of death, and later he got access to the ducal library of Wolfenbüttel — a library that to this day is famous for its collection of dance of death literature. Here Helmuth found what he calls "the original woodcuts", but which in reality were Heinrich Vogtherr's woodcuts. It appears that Helmuth only used two sources: Christian de Mechel's engravings and Vogtherr's woodcuts. The latter were published by Jobst Denneker in 1544 and are characterized partly by containing a dialogue for each dancing couple — as all "proper" dances of death have — and partly by the addition of a scene that none of the other Holbein-clones have, namely the adulterer (picture below). Helmuth then combined Vogtherr's 41 pictures with de Mechel's 46, took the frontispiece and the descriptive letterpress from de Mechel and the rhymed dialogue from Vogtherr/Denneker. The title itself reveals Helmuth's two sources: »Der Todtentanz oder der Triumph des Todes nach den Original-Holzschnitten des Hans Holbein«. 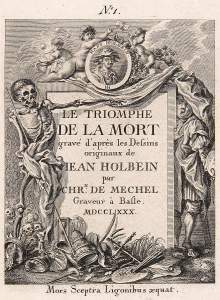 The first half, »Triumph des Todes«, is a reference to Christian de Mechel's "le Triomphe de la Mort", and with »Original-Holzschnitten« Helmuth evidently referred to Vogtherr's copies. In this manner he no doubt thought to have recreated the complete publication, and a reviewer wrote joyfully: »Eine so vereinigte Ausgabe kann Kunstfreunden nur willkommen seyn, da sie vollständiger als andere ist«. The result was a mixed bag. The frontispiece (to the left) is a copy of de Mechel's. Then comes a description of 46 of the pictures, which — as Helmuth himself points out — relies on Christian de Mechel's descriptions. What Helmuth forgot to mention is that he had added the adulterer from Vogtherr's woodcuts, and in return had skipped the waggoner, so there remains 46 on the list. Vogtherr: The adulterer. 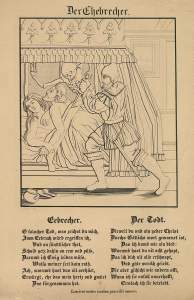 Death stands behind the bed, holding the woman by her hair and placing his hand on the jealous husband's dagger. 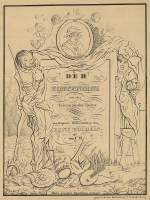 Helmuth's copy: Death stands behind the bed, raising his hand with the hourglass. Then comes Helmuth's lithographs of the dance of death. Below each lithograph stands the dialogue from Vogtherr / Denneker's book. This means that the astrologer is taken out (for the while) since he doesn't appear in this book. What is more odd is that the Creation, Bones of All Men, Judgment Day and The escutcheon of Death are also missing. While they weren't included among Christian de Mechel's engravings, it's hard to see why Helmuth couldn't have copied them from Vogtherr. As mentioned he didn't have any qualms about adding the adulterer. It should be noted that Vogtherr's original version of the adulterer (picture to the left) was a rather unpleasant picture, where Death holds the woman fast by her hair so the husband can pierce the adulterous couple (picture to the left). 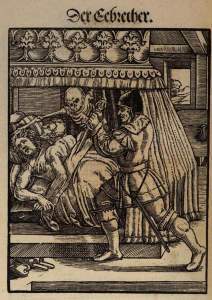 It only appeared in the 1544-edition, and in the following editions it was replaced by a new one: The same bed and the same room, but the couple are sitting together in the bed when Death arrives with mirror and hourglass. (1) Helmuth has instead altered the picture so Death isn't holding the woman's hair but instead raises the hourglass (picture to the right). After these 37 figures with accompanying text comes those eight figures that de Mechel has, and Vogtherr doesn't have. These are the astrologer and those figures that were added to the genuine Holbein-woodcuts from 1547 and onwards. For inscrutable reasons, Helmuth — as mentioned — skips the waggoner. Scholars have not heaped much praise on Helmuth for his "reconstruction", but his publications sold well. His oversized outline-drawings were not without effect. Initially he published his lithographs as booklets. The first booklet contained the frontispiece, the Fall, the Expulsion, After the Fall, pope, cardinal, bishop and abbot. The second booklet contained canon, priest, preacher, monk, abbess, nun, physician and merchant. In 1836 the lithographs were bound into a book. The front page was Holbein's Bones of All Men, and the back page was a sort of collage, which included elements from Holbein's Judgment Day. Two of the lithographs can be seen at The Virtual Copperplate-Cabinet (search for "totentanz"). The Virtual Copperplate-Cabinet is partially run by Herzog August Bibliothek in Wolfenbüttel — the very same library where Helmuth had found his "original woodcuts". The Copperplate-Cabinet assigns the two lithographs to "H., C.". Helmuth had copied the frontispiece from Christian de Mechel. Helmuth copied the scenes from Vogtherr, including the adulterer. 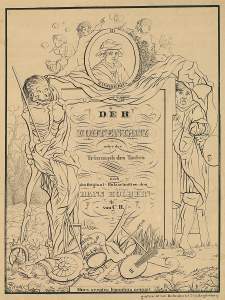 Uli Wunderlich informs us, that Vogtherr's original picture caused outrage and has been destroyed in some of the surviving copies: »Die Ehebruch-Szene in de Neckers Totentanz empörte die Zeitgenossen. Das Bild ist in einigen der erhaltenen Exemplare zerstört; es kommt in den meisten späteren Ausgaben nicht mehr vor«.